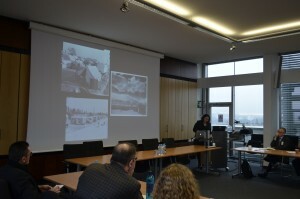 The symposium was a collaboration of the Obama Institute for Transnational American Studies at the Johannes Gutenberg University in Mainz, the Center for Material Culture Studies at the University of Delaware, as well as the Winterthur Museum, Garden, & Library. The symposium offered a rich exchange of ideas surrounding the topic of movement of peoples and objects across space and time, as well as the various approaches to material culture study utilized by scholars today. 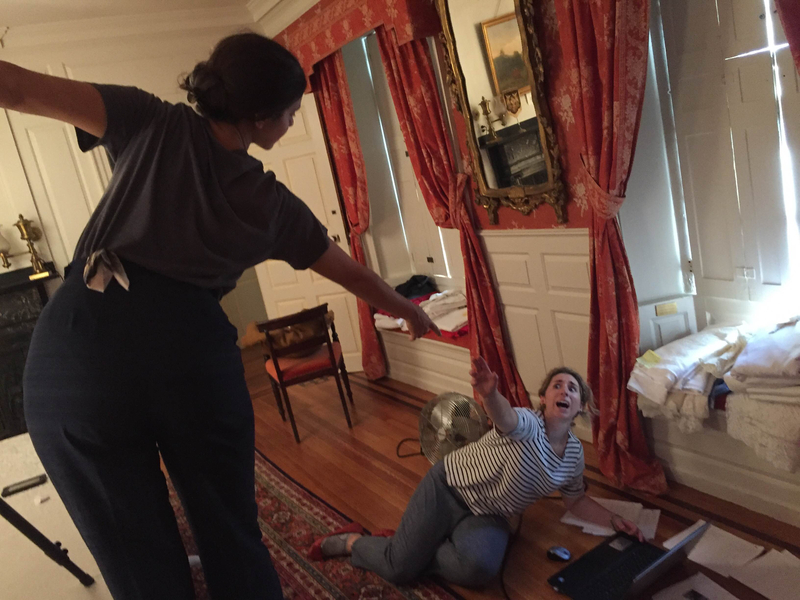 This blog post is by Erica Lome, a student in the History of American Civilization Ph.D. program at the University of Delaware. This fall, she will be a Graduate Assistant at Nemours Mansion & Gardens. 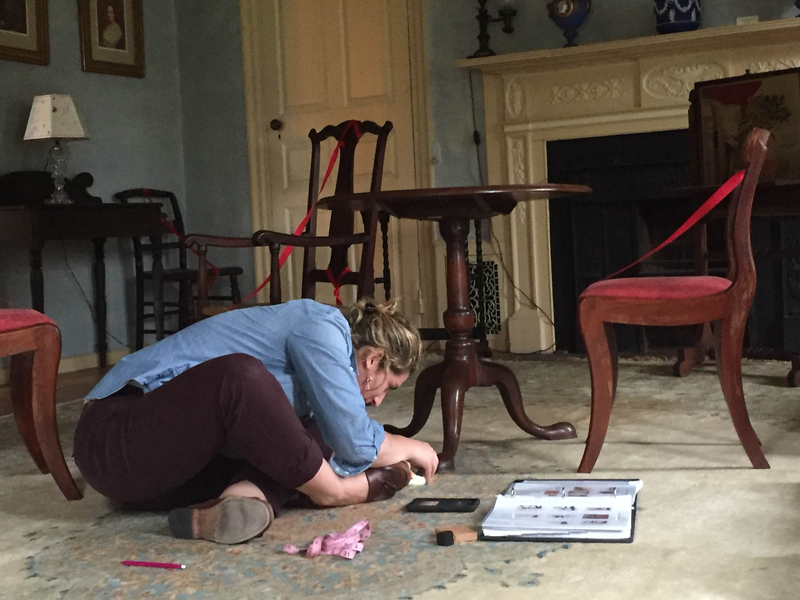 A summer in Boston can really fly by when you’re exploring beautiful historic homes and encountering new types of furniture. 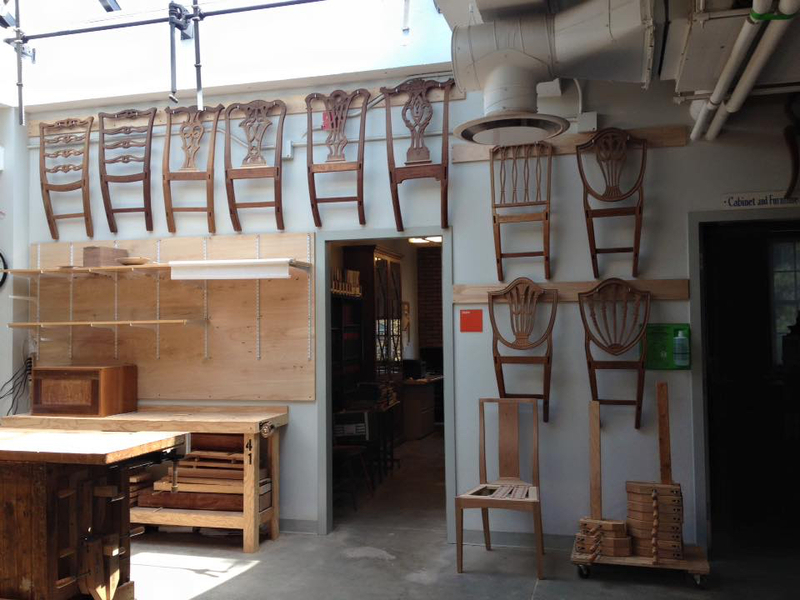 My first blog post about my experience with the Boston Furniture Archive (BFA) covered only our orientation and the first few days of working at a site. Since then, we’ve visited four vastly different locations spanning distinct periods in American material culture. First, the 1749 Spooner House in Plymouth where one family lived for over 200 years. 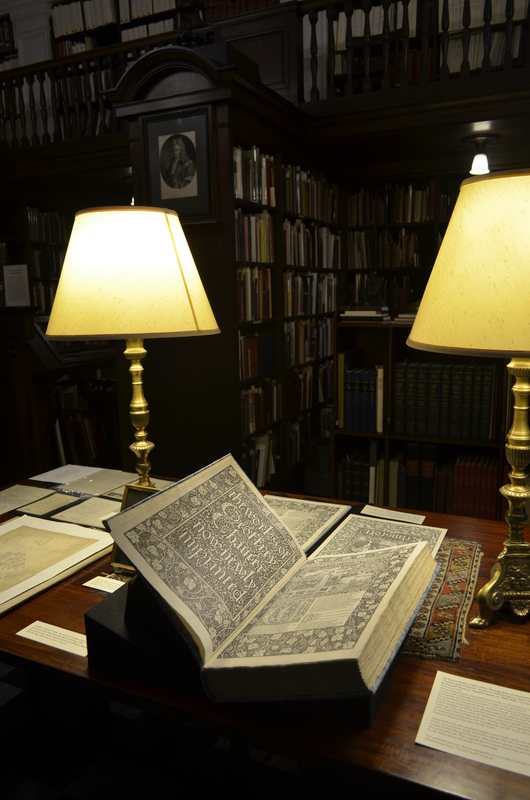 Then, onto the Bostonian Society (est.1881) located in the Old State House, where a dedicated group of antiquarians assembled to preserve the property and create a repository for objects significant to Boston’s history. Along the posh streets of Back Bay lay our next destination, the Gibson House Museum, a snapshot of Victorian domestic life circa 1860 untouched by modern museum interventions. Lastly, we recently finished a week at the Loring-Greenough House in Jamaica Plain, built in 1760 for Commodore Loring. 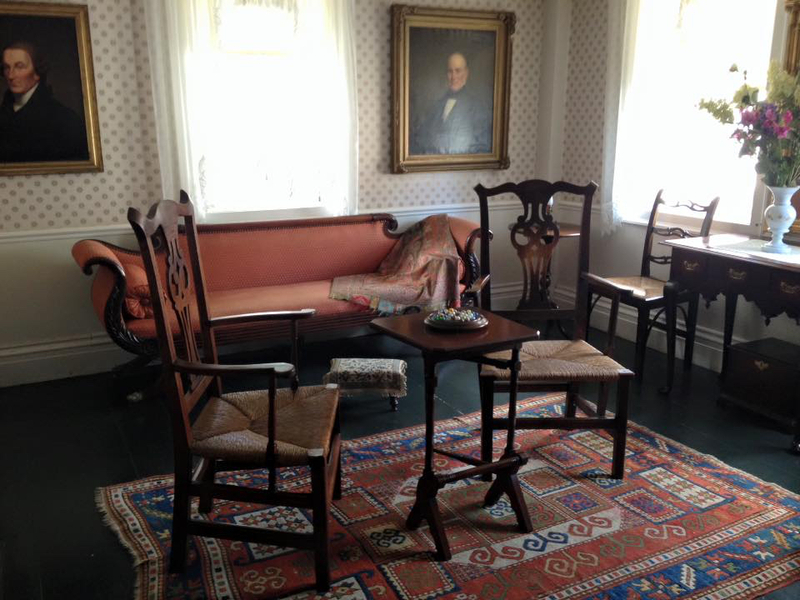 While its gardens are used primarily as a public recreation space for the community, the house is often closed to visitors and contains both original objects and those collected by the historic Jamaica Plain Tuesday Club. At these sites, we encountered English beds from the seventeenth century, ornately carved Renaissance Revival sideboards, Queen Anne tea tables, and reproduction Chippendales. 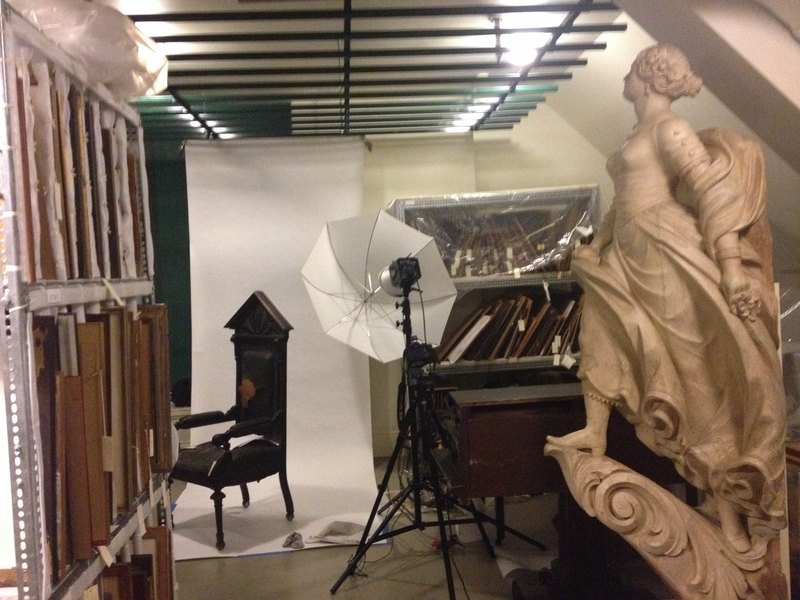 While I’ve benefited tremendously as a historian from this experience, I have also learned a great deal about what it takes to manage, steward, preserve and interpret collections at small institutions and museums. Curators and board members alike were deeply invested in the holistic mission of their sites and provided us with records, inventories, and family histories so that we could view the objects we catalogued as part of a larger historic and personal narrative, rather than as isolated specimens. That being said, the day-to-day work of cataloguing and photographing led to some unique learning moments. Rather than recap everything I did, I’ve decided to list some of the important and unexpected lessons I’ve learned which may benefit future scholars in the field. 1) Space is nearly always limited. 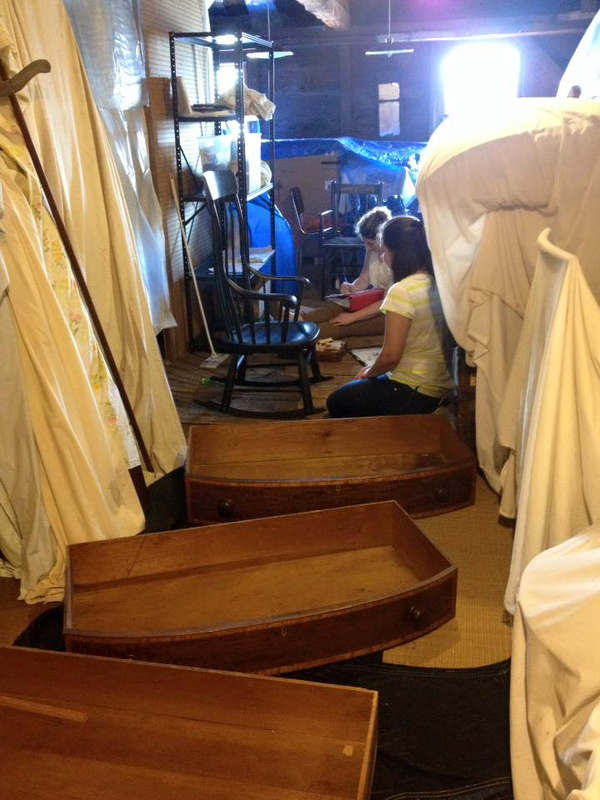 At the Bostonian Society, we worked in a narrow storage room, with chairs crammed into nearly every available corner. The Society started out collecting objects relevant to the interests of its founders, which included many nineteenth-century pieces. Presently, the Society is focused on building up its Colonial and Revolutionary-era collections, so many of the pieces formerly on view have been placed out of sight of the public. With these challenges, we had to be creative when it came to staging a photography studio, and flexible (literally) about moving around. 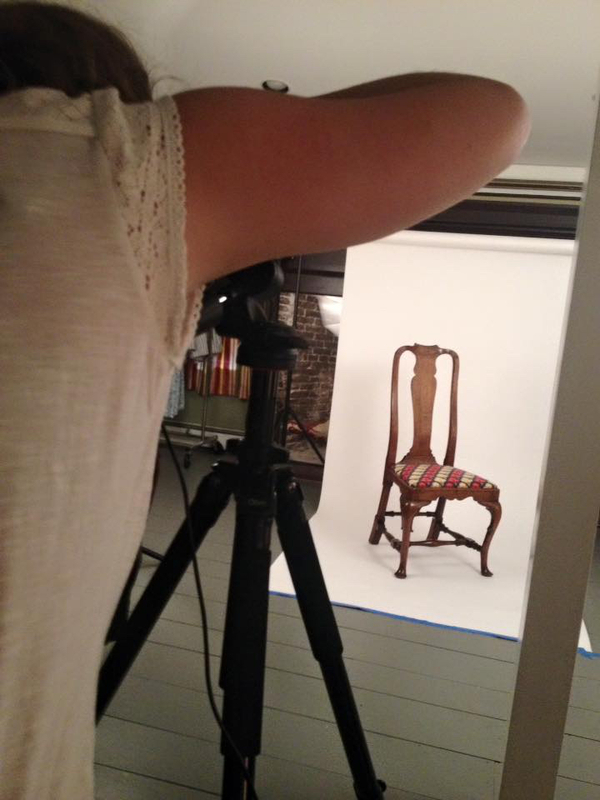 We encountered similar space issues when it came to shooting furniture too heavy to move. You won’t always have a great space to work in, so come prepared to problem-solve! 2) Furniture lies. A piece you thought you examined in one kind of light will end up having a bunch of marks (graphite numbers, signatures, chalk inscriptions) under the super-intense lights of the photo studio. Varnish, especially coatings applied during the late nineteenth to early twentieth-century, will disguise the wood grain and make identification difficult, or may appear to look deceptively like veneer. Additionally, a table that looks steady on its feet in the corner will turn out to have a pin loose, or is held together by some glue. 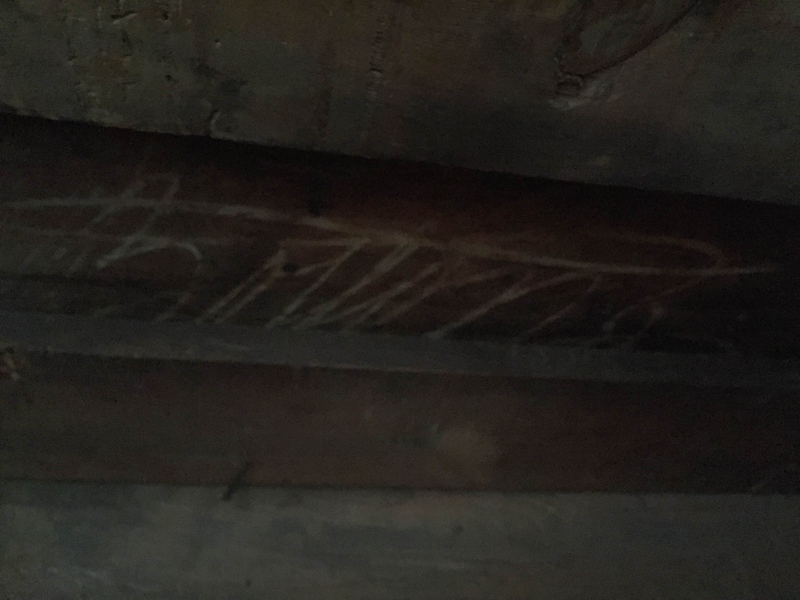 I found this chalk signature on the underside of a fall-front desk, after removing all the drawer components. Quite a surprise! 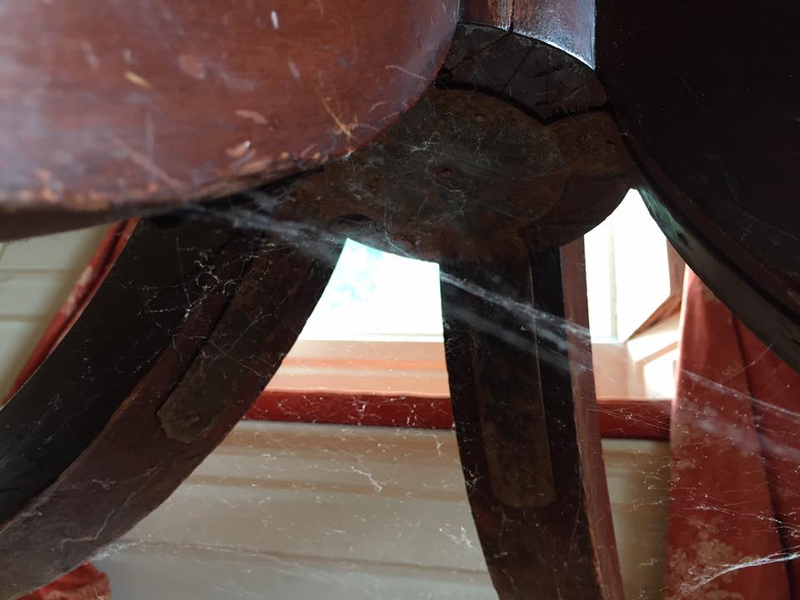 3) Be ready to face years and years of cobwebs built up in every nook and cranny. Likely, there will be some critter still crawling around and angry that you’ve disturbed their home. 4) Strength is key! We often joked that part of our training should have been a furniture boot camp, where we would deadlift armchairs and do squats with pedestal-base tea tables. In order to avoid straining our backs, we had to train ourselves to lift things the right way. Some pieces took all four of us to move, all while half-blind and maneuvering around obstacles. 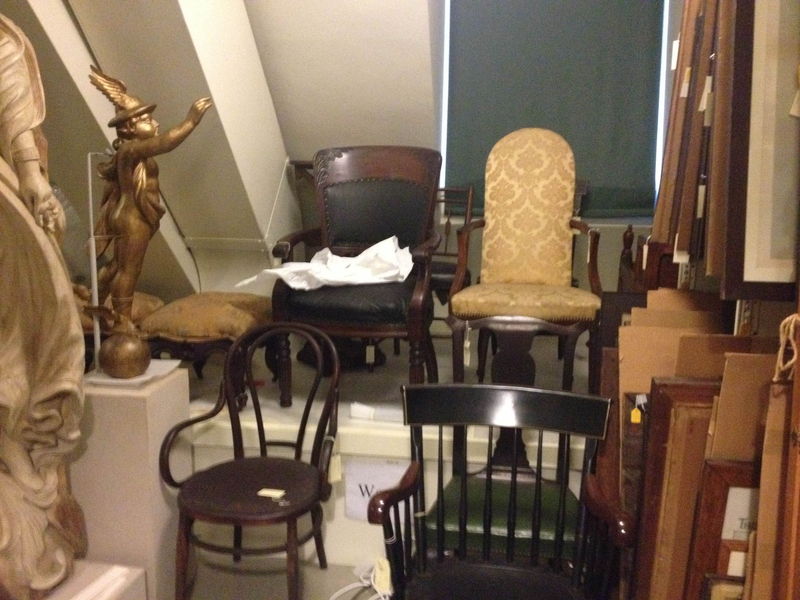 An example of the diverse holdings of chairs from the Bostonian Society, and the problems their surroundings presented when it came to moving them. 5) Drink water, you fool! Summertime in Boston is no joke. You will likely one day work in a historic house with little to no air conditioning, and you’ll probably be working in the attic too. Our time at the Gibson house was punctuated by periodic water breaks and trips downstairs to the small fan for a moment of respite from the humidity. With the bright studio lights adding ten degrees to any space we were in, paying attention to our bodies was crucial. A selfie taken in a moment of rest in between shooting at the Gibson House. 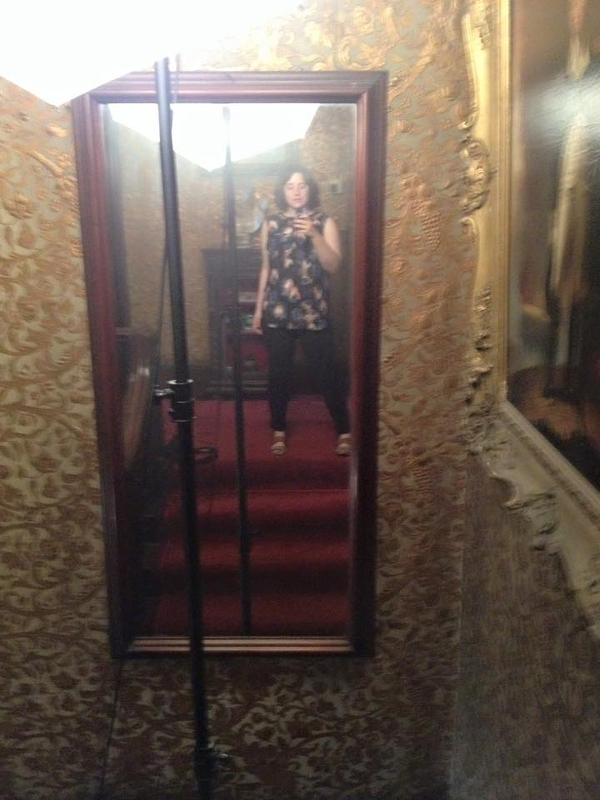 Between the lights, carpet, and insulating wallpaper, it was a very hot stairway. 6) Communication and Collaboration. 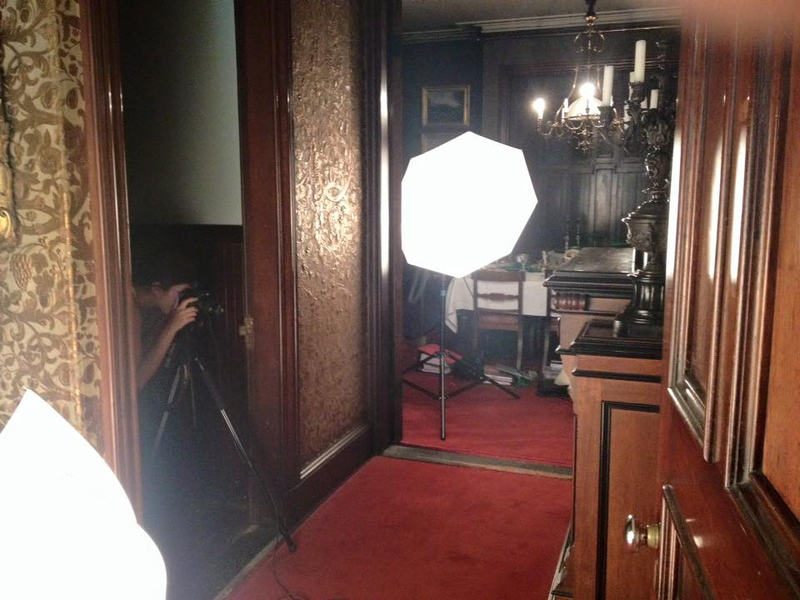 At the beginning of the summer, we worked in pairs to catalogue each object and photograph them. Once we grew more confident in our skills, we found it more effective to divide-and-conquer and work solo on smaller objects like chairs and side-tables. However, it is silly to think you alone can know everything there is to know about a piece of furniture. 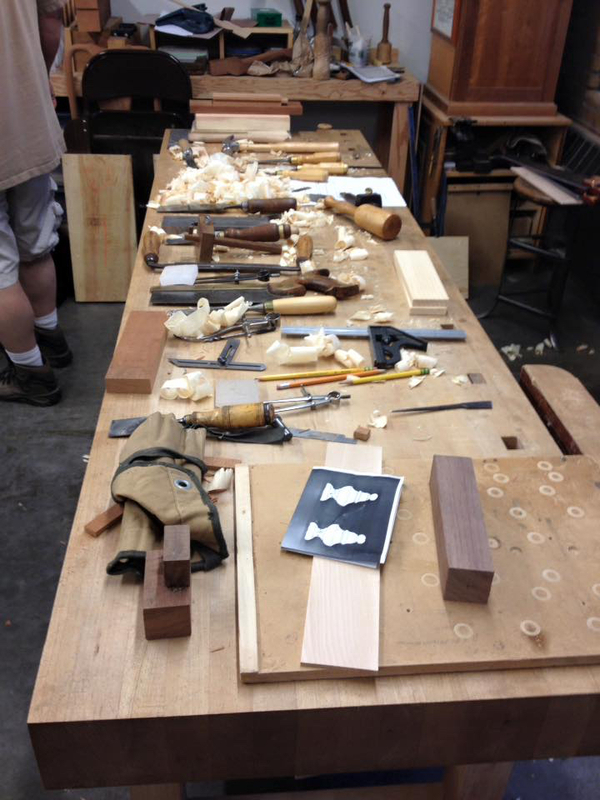 I still have trouble with wood identification, and frequently sought the advice of my cohort. Alternatively, I could helpfully point out the differences in a Federal (1795-1815) vs. Empire (1815-1840) example when asked. We also took turns consulting our traveling library, looking for similar examples to guide our decision-making. When it came to photographing stationary pieces like tall case clocks or secretaries, we all worked together to hold up white backdrops and brown felt to decrease the reflective glare on tabletop surfaces. Tiring work, but worth it for the catalogue-worthy picture. 7) Have fun! Once our group started clicking, we could approach our tasks with a good amount of levity and humor. Picture four tired, sweaty young women gazing with intense focus at a chair…inside of a thrift store with pop music blaring. After a day of moving and photographing (hot lights! ), we took a well-deserved ice cream break and wandered into a local shop. Secondhand furniture lingered in the corner, and although it was clearly a reproduction, someone wondered aloud what kind of wood it was and the four of us leaned in for a beat of silence, faces screwed in concentration, and then we burst out laughing. Even in our off-hours, we still had furniture on the brain! If this experience has taught me anything, it is to always be looking. Once you know how something is put together, or can recognize its stylistic influences, you see your material environment in a completely new way! 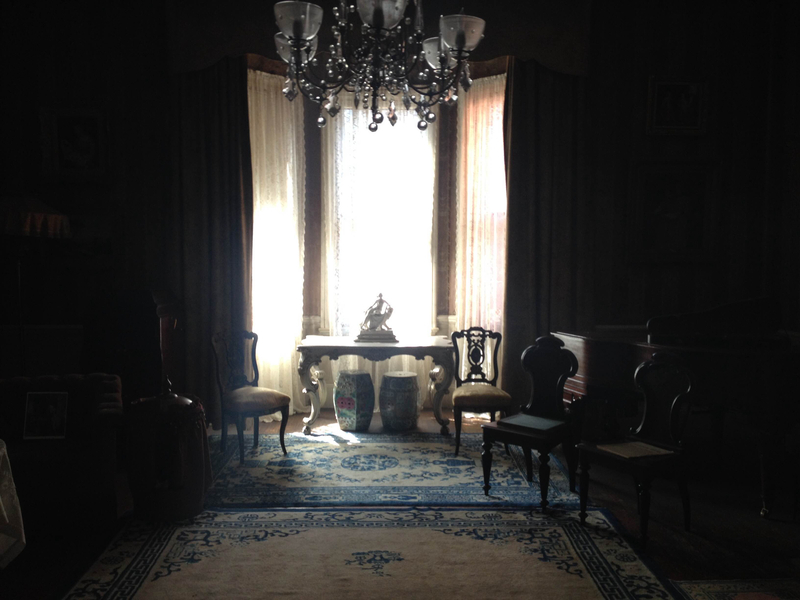 One member of the BFA came to work sheepishly admitting she had spent the night before trying to figure out the wood of every piece of furniture in her bedroom; another claimed she couldn’t finish a movie set in the colonial era when she spotted an Eastlake piece in the periphery of the frame. As for myself, going with my mother through the famous annual Brimfield Antique Show became a chance to play “Antiques Roadshow,” to her delight. With worksheets to transcribe and photos to edit, my summer in Boston will end on a more mundane note. 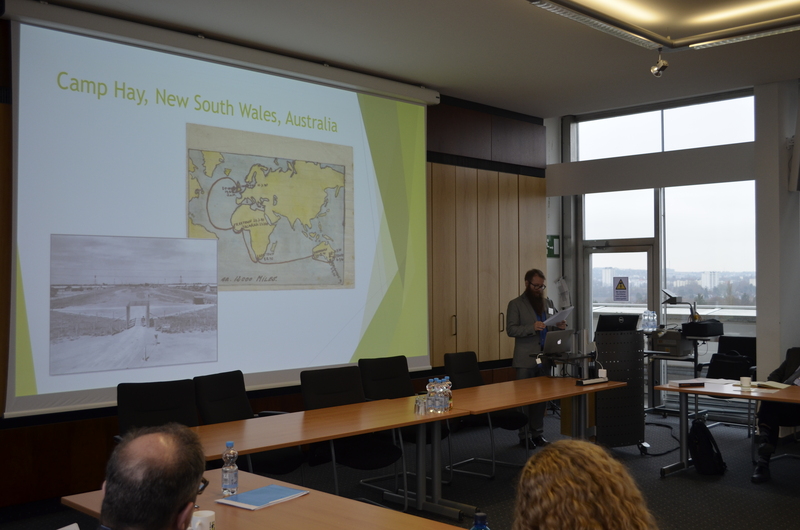 However, I’m proud that my efforts will contribute to future scholarship and discoveries in the field of material culture. I return to the University of Delaware excited and prepared to tackle any new collections that come my way. About the author: This blog post is by Erica Lome, a student in the History of American Civilization Ph.D. program at the University of Delaware. This fall, she will be a Graduate Assistant at Nemours Mansion & Gardens. Watching intently as the workshop leaders shuffled hot embers from the front to the back of the hearth at an introductory hearth cooking workshop I took at Landis Valley Village & Farm Museum yesterday, I wondered whether I would have a chance to probe and prod meat again as it simmered and stewed over the fire. The first time I wielded a spatula was earlier that morning when I was directed to flip the meatballs. After accomplishing that mission, I stepped back to help chop and mix up turnips, onions, parsley, and butter. Lots of butter. As a historian of the material culture of everyday life of early America, I spend a lot of time in museum collections and archives. As a result, I know how all this stuff works in theory. I’ve read countless historic recipes and walked past more hearths in historic houses (usually over-accessorized) that I can count. 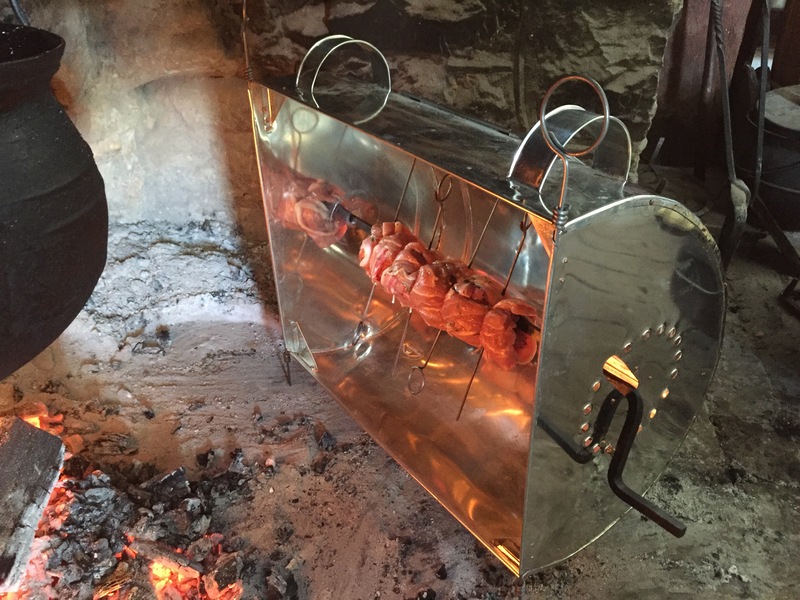 I’ve also seen cooking over a fire demonstrated in a variety of reputable historic sites and houses. But I registered for the workshop to expand how I learn about and interpret the past. In other words, to bring my interpretative powers up to the next level, I knew I needed to get some time in front of the fire and to dedicate more time overall doing living history. When I say “living history,” I mean what museum and cultural heritage professionals refer to as practicing or enacting activities of the past (such as sewing, fighting, or just passing time at home), often wearing clothing from that period also. Some better-known historic sites that incorporate living history into their visitor experience include Colonial Williamsburg and Plimoth Plantation, but there are plenty more fine examples out there. As living history professionals and hobbyists and experimental archaeologists (or any teacher, really) will tell you, doing is knowing. And I want to do more doing. I wanted to learn if you really could cook a chicken over hot coals in time to have it for dinner (yes!) and how to manipulate the cooking equipment to make food cook faster or slower (it’s complicated). But I also learned things that will add subtlety to my understanding of the past I probably could not have learned any other way. I learned, for instance, that when you bend over a pot you have to battle your own shadow to see inside whether the lamb is still red. I learned what food tastes like if you get it too close to the embers. I also learned why any sort of warming plate, tray, or cabinet you find in any number of museum collections would have been desirable given how darn cold once warm and toasty chicken gets if it’s been sitting to the side of the hearth while you’ve been baking potato rolls, sautéing mushrooms, and roasting pork-wrapped bacon in a tin reflector oven. I did something! I know more now. What I didn’t expect to learn was how much of a twenty-first century person I really am. But that’s exactly what happened. As I was minding the lamb in the small cauldron, flipping it periodically to sear it before we threw it into a pot with veggies to make a stew, I accidentally catapulted a chunk of lamb into the fiery embers. “Oh, no!” I gasped with genuine worry as I watched the cube of lamb become a red fireball, indistinguishable from the surrounding coals. I panicked, just like I do at home when I drop something on a stove burner. I looked around desperately for help. How would I get a burning piece of meat out of the fire? It’s going to smell terribly! Won’t it set off a fire alarm? I was surprised that in the midst of my horror, everyone was standing calmly behind me. Most were chuckling. Of course they were. We already have a fire. A big one. In the hearth. I wasn’t making it any worse. Right. We’ll just scoop it up. Of course! I apologized profusely. But I don’t think I was really apologizing for losing a nice piece of meat or even for Marsha having to move it aside. I think I was apologizing for caring so much. In this context, dropping a piece of meat onto a cooking surface wasn’t a big deal. In the space of just a few moments, I had found the gap between my pre-industrial self and my twenty-first century self. And it was a large one. Yes, doing is knowing. Change over time was never so apparent. There are lots of books that the history of domestic life and kitchens. I will list just one here that focuses on kitchen spaces. Nancy Carlisle and Melinda Talbot Nasardinov with Jennifer Pustz, America’s Kitchens (Boston: Historic New England, 2008). 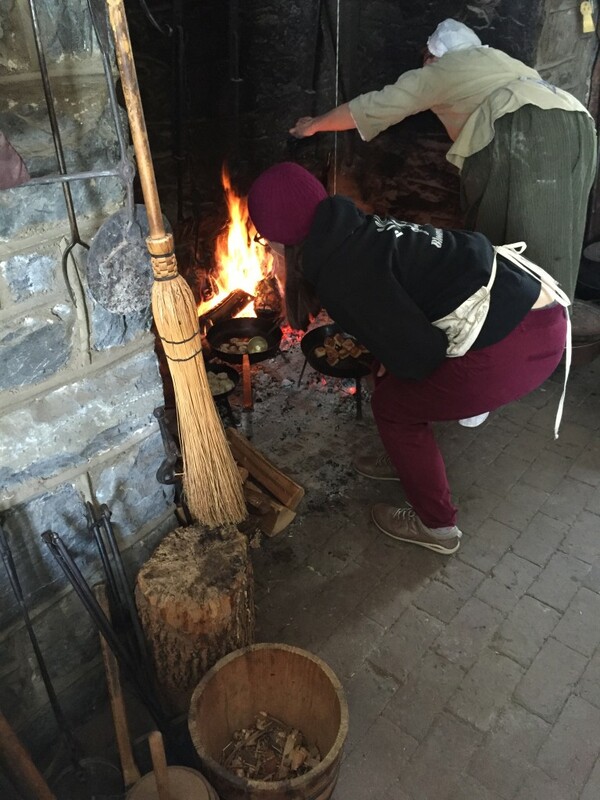 Many museums and historic sites around the country host single- and multi-day hearth cooking workshops. See, for example, Old Sturbridge Village, Genesee Country Village and Museum, Historic Deerfield, and Old Salem Museum & Gardens. Investigate museums in your area and find your own adventure! 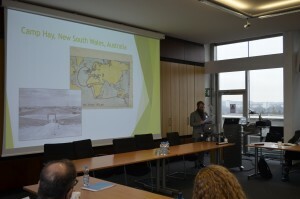 If you’ve participated in a historic foldaways workshop you particularly liked, let me know. You can also pay visits to many wonderfully intact historic kitchens at historic sites. In this area, check out The Woodlands in Philadelphia (circa 1786) or The George Read House and Gardens (1803-1805) in New Castle, Delaware. Do you have a favorite? 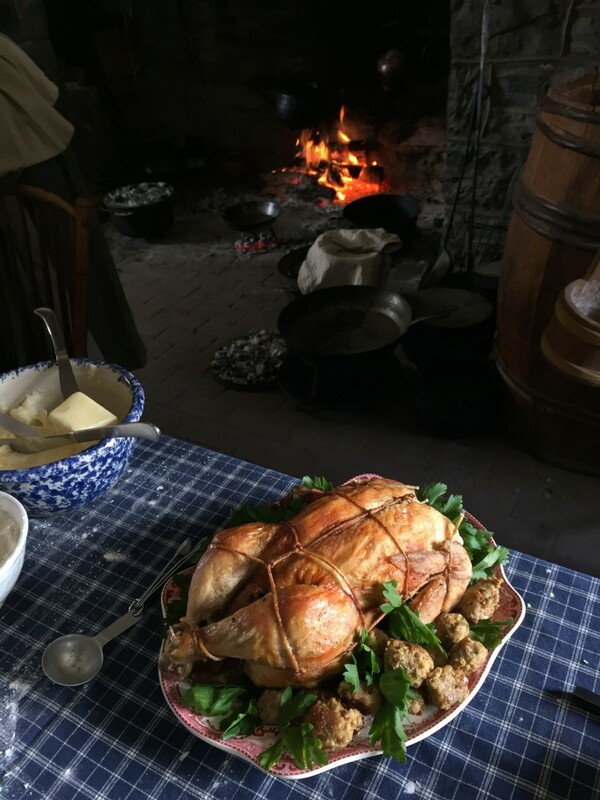 If you want to learn and talk about about historic foldaways with members from the Philadelphia region, follow Cliveden’s Kitchen Conversations programming. About the author: Nicole Belolan is a Ph.D. Candidate in the History of American Civilization program at the University of Delaware. She is writing a dissertation about the material culture of physical disability in early America.This blog post was originally published at her professional web site. Nicole tweets @nicolebelolan. Long before the DIYers at Pinterest promised 101 natural household cleaners to simplify our lives, before Gwyneth Paltrow and Blake Lively offered us tips on “life curation” that involved making heirloom tomato sauce and purchasing $1300 Pendleton wool cloaks, even before Martha Stewart created her first paper Christmas tree skirt and declared it a “good thing”, early Anglo-American advice writers instructed their readers on how to live frugal, healthy, and “beautiful” lives. Like the followers of today’s lifestyle gurus, early American readers purchased advice books on household management and new types of cookery with the hope of making their lives simpler. And like anyone today who has tried to replicate a craft project they saw on Pinterest or made Gwyneth’s Quinoa stuffed Kabocha, these early Americans probably realized they were buying a certain amount of hogwash. Scholars hesitate to rely on prescriptive literature in their research because, as the name suggests, it was often aspirational, prescribing behaviors, practices, and material goods that the author believed would refine society—and which were missing from the majority of early American households. Although authors advertised their books as a necessity for every family, the advice they contained was geared towards the wealthier members of society. Advice written by a pseudonymous “Lady” or “Society of Gentlemen” encouraged the mistress of the household to mix her own silver polish, repair gold lace on gowns, or mend broken porcelain, ignoring the fact that the reader may not even own such luxuries, and if she did, would depend on her servants to care for them. 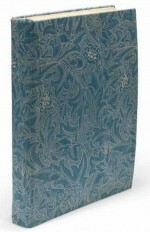 The advice books assumed a level of affluence that was uncommon in most early American households. And unlike today, where those with the most money and leisure time are the primary audience for the DIY projects promoted by Gwyneth Paltrow’s Goop and Blake Lively’s Preserve, the leisured classes of early America usually occupied a supervisory role in household labor, directing the efforts of their servants to cook, make, and mend. The Universal Receipt Book, 1814. The advice contained within these books falls within several different categories. A substantial portion of the literature focuses on how to create imitations of popular consumer goods within the home, particularly popular patent medicines and elixirs. Other sections describe how to increase the durability of household goods, such as preventing rust on cutlery, preserving blankets from moths, and removing spots from woolen clothing. A surprising amount of advice centers on the use of household objects to deceive people and how to judge consumer goods so as not to be duped by others. Nearly every book I’ve encountered from the late 18th and early 19th centuries includes instructions on how to make cheaper woods look like mahogany, disguise brass as gold, or dress flax so it resembles silk. The same literature, however, reflects a fear of being deceived about the value of goods by others. Authors advise readers on how to detect adulteration in soap, gin, flour, and other items so they would not be poisoned or simply cheated out of their hard-earned money. 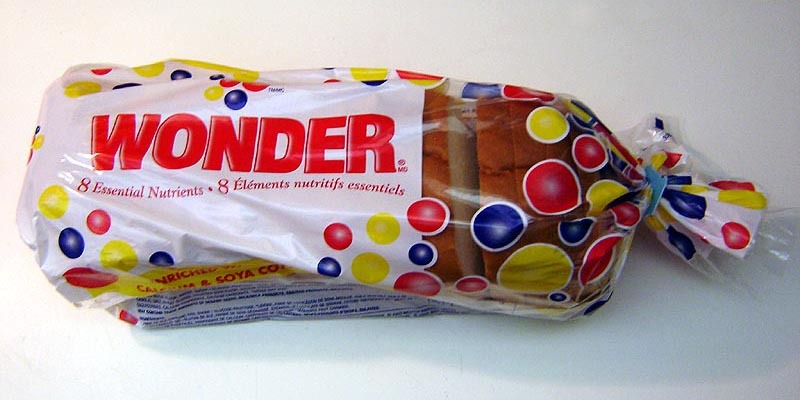 Recipes for renovating rancid butter appear alongside methods for determining whether or not flour had been adulterated with no apparent sense of irony. Such recipes not only speak to people’s anxieties about misjudging new consumer goods, but also fears of being (accurately?) judged as poor and uncultured. These books may reflect more to people’s anxieties than their actual practices. With such a scattershot approach to dispensing advice and poorly conceived ideas about its potential audience, is there anything useful to be gleaned from this literature? I would argue that for scholars of material culture, there is much to uncover. My current research focuses in part on how early Americans purchased, maintained, repaired, and lived with consumer goods. 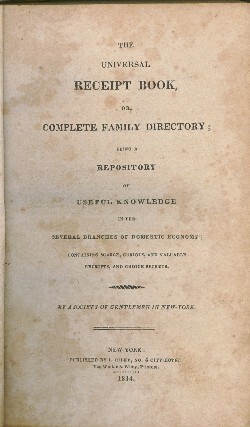 While some information on these practices can be deduced from period diaries, letters, probate inventories, and other sources (which all present their own unique challenges and limitations), aspirational literature maps out the constellation of goods familiar to consumers, even if some were beyond the reach of most people. It suggests that consumers sought advice about how to care for their new goods, that they sometimes sought substitutes for goods that were beyond their means, and that they could be suspicious of the quality of goods imported from beyond their town, region, or nation. And while most people didn’t employ the exact advice promoted in these books, they could adapt it to fit their own needs. Similarly, just because I don’t have an outdoor pizza oven in my garden like Gwyneth Paltrow, doesn’t mean I can’t try her recipes in my own, more limited, kitchen. So, was anybody following these recipes and advice? At least a few were. Many advice books contain newspaper clippings for recipes and remedies for illnesses that suggest readers were using them as repositories of knowledge. An elusive hand-scrawled note may comment on a particular entry’s efficacy. Very occasionally other sources corroborate this prescriptive evidence. In her diary from December 1769, Hannah Callender Sansom described purchasing and mixing the ingredients for Daffy’s Elixir before spending the rest of the day mending. 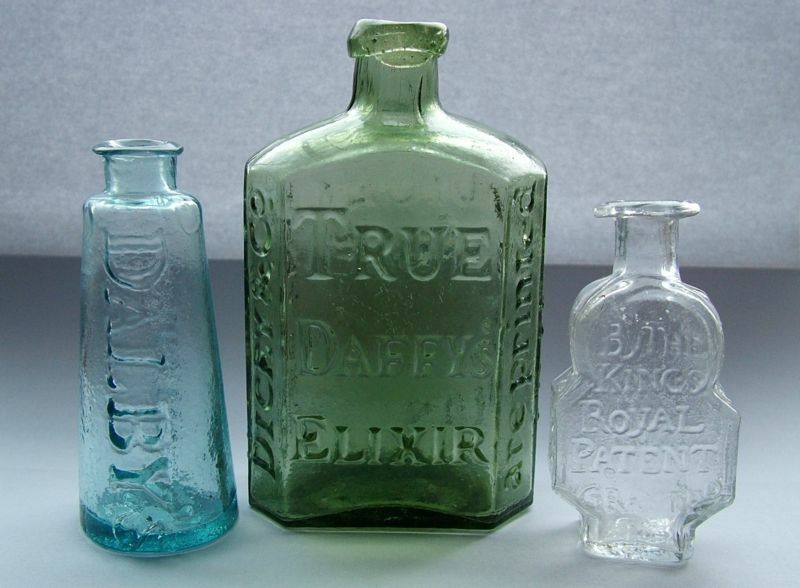 Daffy’s Elixir was a popular patent medicine composed of senna, brandy, fennel seeds and other ingredients that was first developed in late 17th century-England and used to treat a variety of stomach ailments. Its popularity is confirmed by the fact that a recipe for “true Daffy’s Elixir” is included in numerous books on cookery and domestic management from the period. While Sansom may not have obtained her recipe for one of these sources, she was relying on her DIY knowledge to produce the elixir rather than purchasing it at the store. So I guess the best advice I can offer is…to take most advice with a grain of salt. Consider the financial means and concerns of the intended audience when exploring prescriptive literature. Don’t assume that when books on household management were purchased they were consumed wholesale—people have a habit of adapting advice to their own needs and discarding anything that doesn’t fit their worldview. And always rub bread on your walls if you want them to look like new. About the Author: Elizabeth Jones-Minsinger is a Ph.D. candidate in the History of American Civilization Program at the University of Delaware. She is writing her dissertation on women’s consumption in early America. You can follow her on twitter @LizJonesAll1Wrd. Nicole Belolan, Elizabeth Jones, and Anne Reilly will all participate as fellows in the University of Delaware’s Public Humanities Institute (DELPHI). 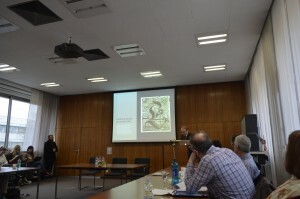 DELPHI exposes graduate students studying material culture to a variety of tools for communicating their research to a broad audience. After two weeks of workshops in June, participants purse their research and work on public outreach projects. 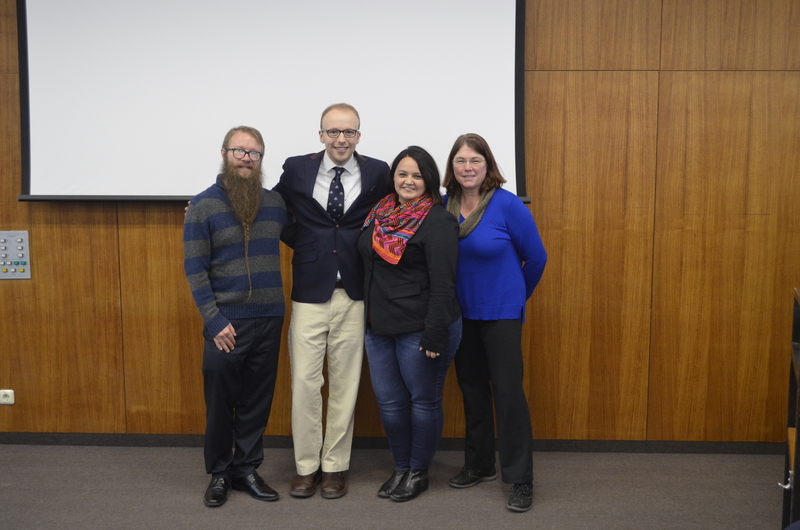 Nicole, Anne and Liz will all continue to pursue research they are conducting for their dissertations. You can read short descriptions of their research below. You can also learn more at the DELPHI web site. 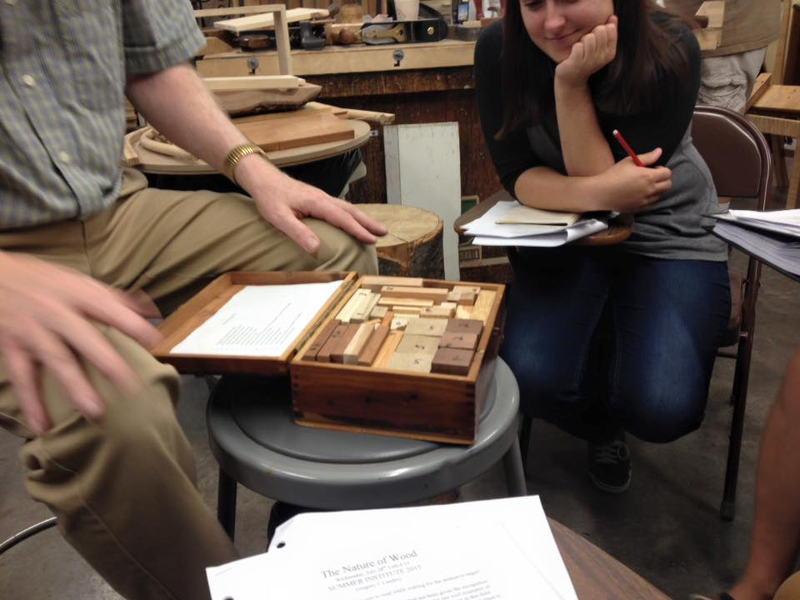 Nicole is working on the material culture of physical mobility impairment in early America. She is investigating how early Americans used objects to manage their bodies and how those experiences shaped ideas and practices related to gender roles, citizenship, and identity. 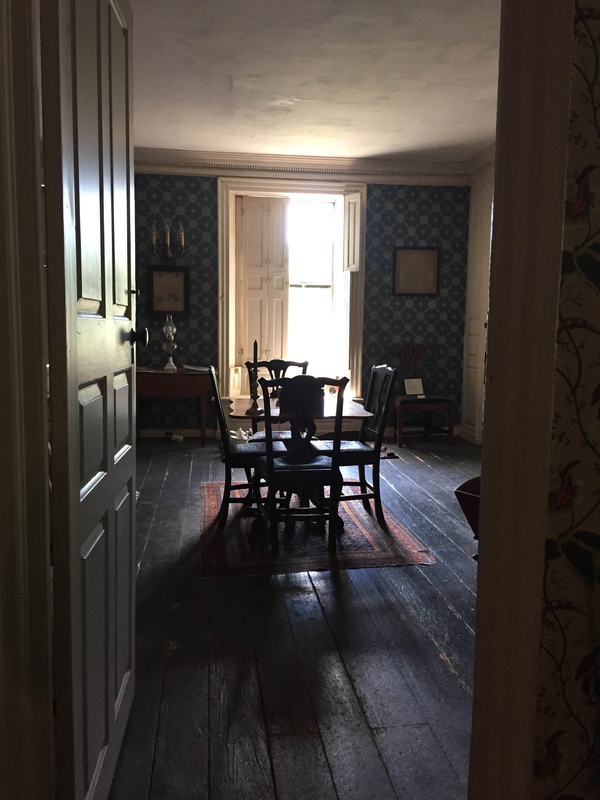 Liz’s research examines the role of women’s consumption in the late-eighteenth and early-nineteenth century mid Atlantic, utilizing methodologies from both economic history and material culture studies. Anne is working on twentieth-century public commemorations. 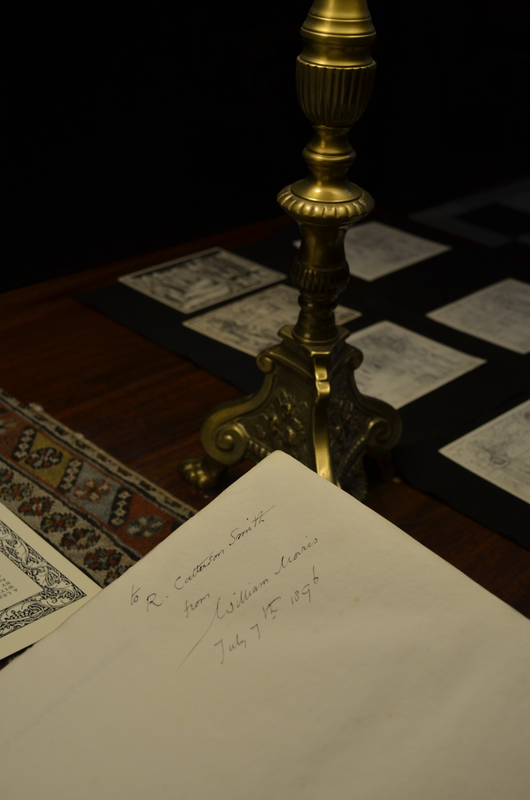 This summer, Anne will continue her research on the 1907 Jamestown Tercentenary. She will begin in Richmond, supported by a research fellowship from the Virginia Historical Society. 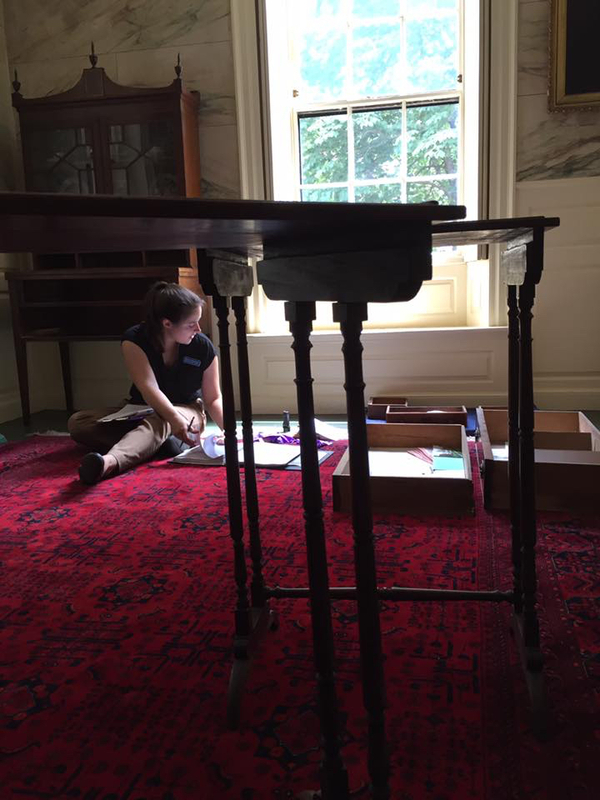 Alison Kreitzer will be interning at the Hagley Museum and Library this summer. She is part of a team working to finish processing the Z. Taylor Vinson Transportation Collection. Researchers will gain access to the 700 cubic feet of transportation (mainly automobile) memorabilia in 2014. 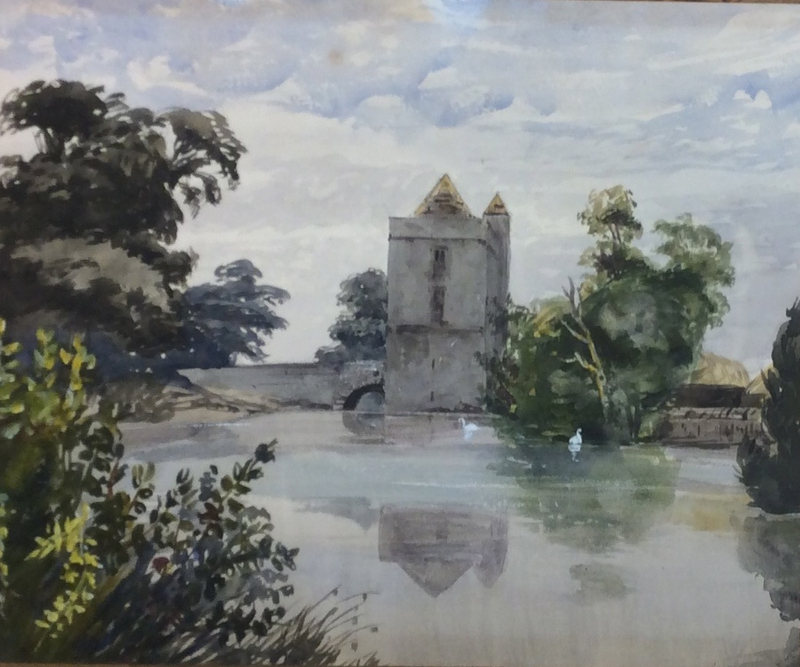 In the meantime, learn more about the Z. Taylor Vinson Transportation Collection by visiting Hagley’s blog. 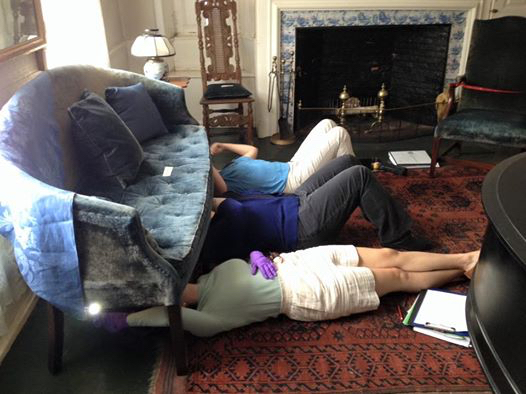 Lisa Minardi is organizing the fifth annual archaeology field school at The Speaker’s House. The house was the home of Frederick Muhlenberg (1750-1801), the first Speaker of the U.S. House of Representatives. Muhlenberg’s house is located in Montgomery County, PA. The dig runs June 4th through 22th. Visit www.speakershouse.org to learn more. 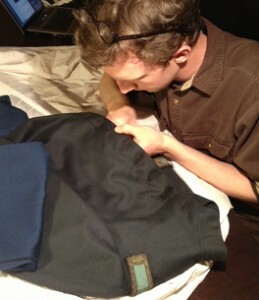 Tyler Putman sewing. His tailoring skills will come in handy this summer while working at Colonial Williamsburg. Tyler Putman will be dusting off his needles to help reproduce the field tent or marquee George Washington used during the American Revolution. 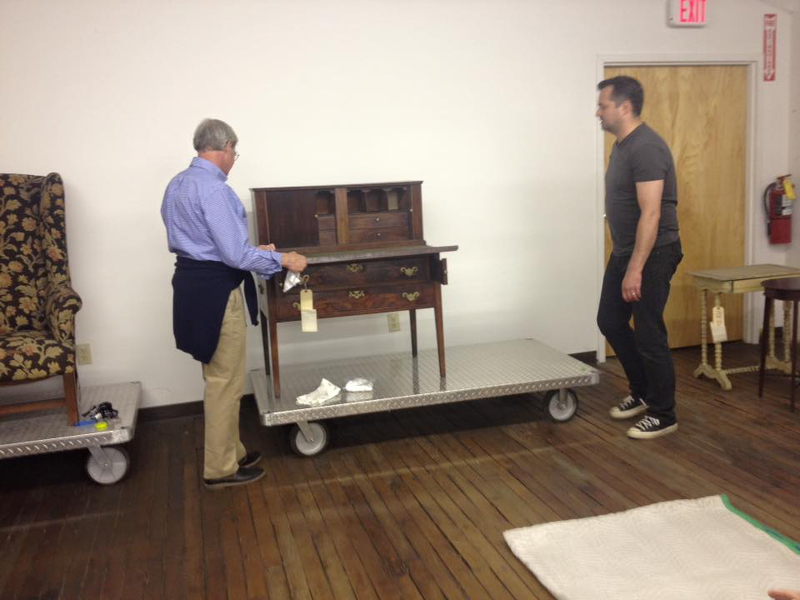 The Museum of the American Revolution owns the original “First Oval Office,” which will serve as the project’s model. Several expert “tailor-historians” will sew the reproduction while interpreting the process at Colonial Williamsburg this summer. You can read more about the project here, and you can “follow” the tent on its Facebook page here. In addition,check out the project’s progress throughout the summer via the web cam. Be sure to check back during the summer to read some reports from the field!